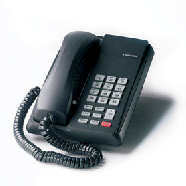 Toshiba NON Display Digital Handset with no user programmable buttons. This phone can be used the same way as the elegance and the classic range of phones but it does not provide user programmable buttons or the display functions that other Toshiba phones can. The phone has no hands free dialling or hands free speech functions. This phone can be used on the Toshiba DK280, CT, CTX, CIX, Strata DK280, Strata CT, Strata CTX, Strata CIX, Strata IP-CTX and the Strata Pure IP-CIX telephone systems.